As obvious from the name, Canada Drug Pharmacy is a Canadian based online pharmacy which sells generic and brand name drugs at discounted prices. The pharmacy is licensed and approved by CIPA and sells generics drugs from the top pharmaceutical companies based in Turkey, Europe, India and Singapore. The website claims to offer up to 90% low prices on some of their drugs. For example, the website sells a package of 12 pills of Actonel for only $47 while the actual price of the drug is $816 thus offering a discount of 94%. 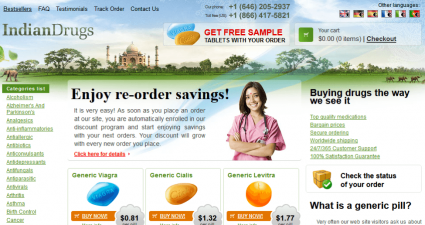 The website sells both prescription and over the counter drugs to their customers. 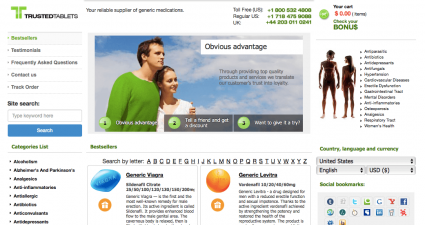 The website requires prescription to process the orders and customers need to create their online profiles to order from them. Shipping is available to customers all over the world with a standard shipping fee of $9.99. Customers can order their drugs through email, mail, fax or online. The website also accepts all major credit cards and other payment methods to accept payments. Customers can contact their customer service through toll free phone contact, email or fax. The large number of online reviews available on the internet reflects that the online pharmacy is popular among customers but there is also evidence from the scam alert websites that the online pharmacy is a considerable risk. Some of the online reviews are also positive but there are also few complaints reported by some customers. There are some customers who claimed that they are buying from the Canada Drugs Pharmacy for many years without any problem. According to Jeff Harwin, who reviewed the online pharmacy on 31st of august 2014, he has been buying the prescription drugs for his wife for many years at discounted prices without compromising on quality. He also praised the customer support and quick responses to his emails. Other reviews also talked about how the online pharamcy helped them save money due to their low prices and disocunt offers. Some customers also praised their customer support which was rated as friendly, responsive and helpful. On the other hand, there are also couple of complaints. According to John D who reviewed the pharmacy on December, 2012, the online pharmacy was great but he complained that they no longer send drugs from European countries but from a less popular Indian Pharmacy with suspicions of poor quality. Even though, Legit Script rated it as unapproved internet pharamcy for not meeting some of the standards they set for online pharamcies, but the rating is less alarming than their more serious listing as rogue pharmacy. On the other hand, the website is also rated negatively by other scam alert websites. Other than that, pharamcychecker.com rated it as a legal and licnesed online pharamcy based in Canada. The license is issued by College of Pharmacists of British Columbia. All in all, the website is rated moderately from most of the customers as there are some complaints about financial loss which makes it a risky online source. 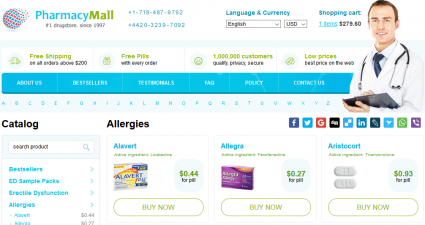 Low trust rating from scam alert websites also makes it suspicious online pharmacy. 2015 is no different from previous years when it comes to online feedback. The website still enjoys moderate online reputation as there are good reviews about them on the internet but still low trust rating. Customers are mostly satisfied with the quality of drugs, wide range of options and friendly customer service but the most praised feature is their low prices which make it affordable for many customers to buy their medications, one of the reasons why most customers are loyal to them. Customers are also happy with their fast delivery. As reviews are posted from customers all over the world, which means they also enjoy a large number of international customers outside of North America. Even though, the reviews are mostly positive but it is reported that the online pharmacy now sells drugs that are manufactured by unknown Indian pharmaceutical companies instead of more reliable European manufacturers. 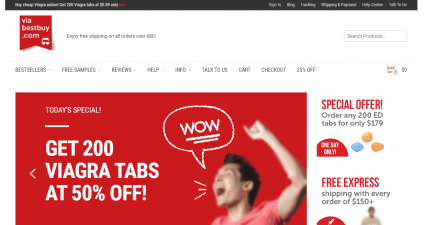 This makes then risk and suspicious online store. As the online store already offers the rock bottom prices with up to 90% lower prices on most of their drugs, additional deals or discounts are not available for now. Coupon codes are also not available but customers can check back later for live deals. The design of the website is very simple and basic and needs improvement. The online pharmacy is well established but risky pharmacy with their actual store situated in Richmond, BC Canada. The prices they offer are rock bottom and their online feedback from customers is also good but trust rating from scam alert website is not good enough. The customer service is praised for its responsiveness while their drug options also make it possible for customers to buy all their medicines from one online source. On the other hand, the quality of generics that are manufactured by unknown Indian pharmacies is a big question. Due to these reasons, the website deserves 2 out of 5 star rating.